While sitting at work today, working, I daydreamed about working at SmartPak. This is not to say I dislike my current job, or the company I work for, quite the opposite actually. But what horse person has not daydreamed about working for an equestrian company, or in the industry in one fashion or another? Maybe you have fantasized about running a barn, being a professional trainer, owning a tack store, or maybe being one of those guys that travels around showing off Natural Horsemanship type of skills, riding with no saddle or bridle, with one of those little microphones clipped to your collar? This daydream was sparked off from a Facebook post from SmartPak I saw this morning of a photo of “Stout”, a boxer puppy, who is sitting in his owner’s office chair. 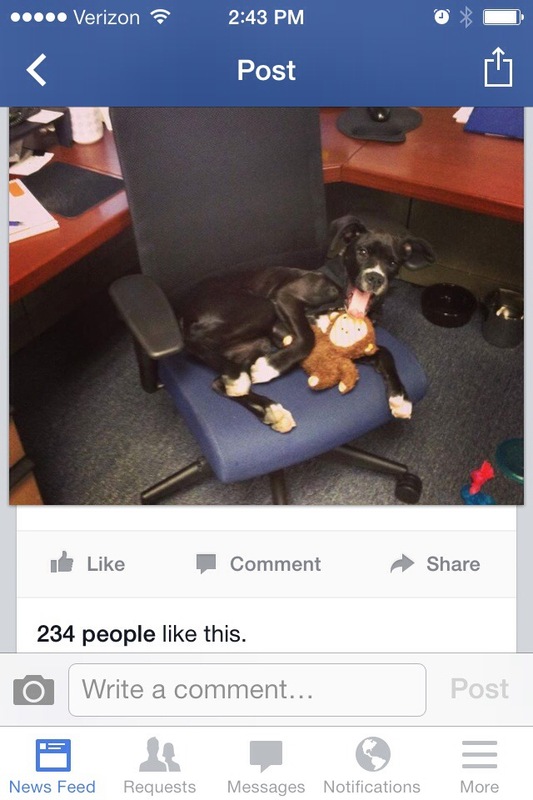 The status mentioned that 40+ dogs go into work at SmartPak every day. Sigh. How nice would it be to pat Daisy’s head after answering an email, and take her for a walk at lunch, super-amazing-fantastic-nice, that’s how! My daydreaming required me to punch up the SmartPak website http://www.smartpakequine.com/ (which just involves typing “sm” before it auto fills on my browser) where I read the company history, and then about the benefits and perks of working there. Not only are they a dog friendly work place, and offer the usual benefits package, but they also have a program where employees can have a percentage of their board or lease paid in exchange for testing new products. Stop right there. Testing products! I love trying new things and then writing reviews! I have reviewed 85 books on Amazon to date, not to mention my reviews on REI, Title Nine and other companies I make purchases from. I did try and review some stuff on SmartPak in the past and had some issues with the reviews not posting, which I did relay to SmartPak customer service. I picture myself making the engraved items, like the bracelets, belts and halters, with Daisy sitting next to me. Maybe packing up orders, whistling off-key while I work, receiving incoming shipments, placing orders, I have experience with all that stuff. Or maybe I would answer calls in customer service. I did work for a telephone survey company for about 4 years during school (I even performed the new hire training for a year, so la-de-da). And yes, we did call people at dinner time almost exclusively. I feel I am pretty good at helping people that are upset, not be so upset. “I am so sorry ma’am, I understand why you are unhappy, let me take care of that right now. I’ll personally make sure Brownie’s supplements get out today.” And I would too. Customer service is so important. This is a strange daydream, right, picturing myself helping unhappy customers over the phone. But, I am wearing riding pants and a polo shirt through all of it. Yep, I am just going to assume in my daydream that employees can wear riding pants to work every day. In my daydream I have on my black winter Kerrits, the ones with the cargo pockets. A few dog treats in one pocket for Daisy, and my headphones and player in the other. I bet half the employees’ passwords involve their dog or horse’s name. Or maybe they have a policy against that?? My daydream continued with me being the “Mounted Games Specialist” at SmartPak. Which in my fantasy involves me picking out some colorful pony and pony-riding-adult sized items to add to the SmartPak selection. I would keep ahead of the games fashion curve, making SmartPak the most popular company for the US games rider. The next SmartPak catalog would have the winning MGAA Nationals Masters team pictured in it holding up SmartPak sponsored saddle pads. And there would also be a turn and burn style photo of a games rider with “A, Kerrits Power Stretch Riding Pants pg 23” and “B, SmartPak AP Saddle Pad pg 46” stenciled onto the image. They would be the first US equestrian supply company to embrace mounted games, all with my diligent work and extensive knowledge. In a year, adults riding ponies would become normal and common place. The too-hot-for-kids 13h pony would have a resale value as equestrians everywhere flock to this “new found sport”. Mounted Games becomes know as the sport for the daredevil and the easy going rider both. And when you say “I mostly play mounted games” other horse people don’t look at you oddly, and say “like little kids in pony club?” or “ok” clearly having no idea what you are talking about. I dug back through my Facebook news feed to take a screen shot of the SmartPak post that sparked it all.